ELIZABETH CITY, NC - Here we go again, Jeep lovers. 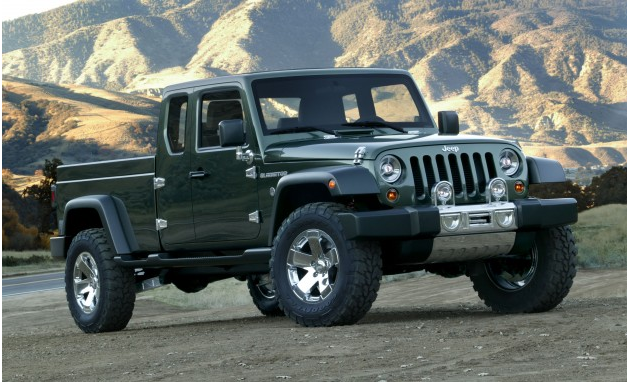 In a week FULL of rumors regarding the resurrection of previously dead vehicles (Ford Ranger and Ford Raptor) Jeep has entered the mix with what could be a "dropping the mike" of sorts; Jeep is seriously contemplating the rebirth of the Jeep Wrangler truck concept! A report from Automotive News quotes personnel from a recent Fiat Chrysler Automobiles meeting saying a Jeep-branded midsize pickup "could begin production in 2018"! FCA sees the Ranger and Bronco announcement, and raises you a WRANGLER PICK-UP ANNOUNCEMENT! Our minds are totally blown right now! The report also states that the truck would have a short bed and make use of the Wrangler suspension bits and powertrains. A final design decision has not yet been made, however that doesn't keep Jeep enthusiasts from bouncing a few ideas around. One of the most popular is the photo shown above, the Gladiator concept from 2005. Its production-ready appearance and sweet-looking side-mounted spare had the Jeep Wrangler faithful salivating, but the project never left the ground.